The Pebble smartwatch is an excellent watch, but charging can be a little fiddly with the included magnetic cable. Looking to enhance the charging experience the Engineerable Time Dock offers an elegant alternative to the bundled charging cable. The metal dock has it’s own charging cable built in and allows the Pebble to be easily mounted and left to charge, this also means your existing charging cable can still be used, handy if you’re going travelling. This Timedock is made from aluminum which has been bead blasted and anodized and it comes in black, silver, gunmetal grey or rose gold. It has a nice weight to it and both looks and feels like a premium product, Engineerable could’ve used plastic and churned out a cheaper watch charger, it’s nice to see they’ve chosen to use more premium materials to match the build quality of the Pebble watch. The Timedock currently works with Pebble Time, Pebble Time Steel and Pebble Time Round and has a detachable charging plate that will allow this to be upgraded in the future if the next generation of Pebbles make use of a different charging adapter. There isn’t much to set up, just pop this on your desk and plug it into a spare USB port. 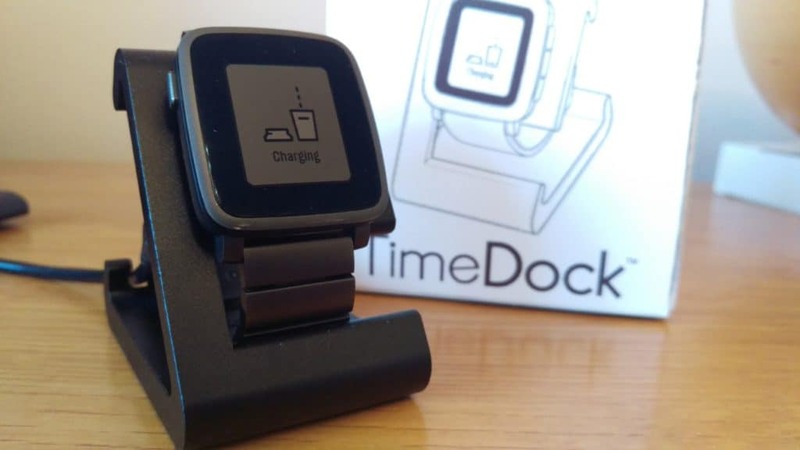 When you want to charge your Pebble watch just slip it on to the docks magnetic charging points, the Timedock will hold the Pebble watch in place allowing you to clearly see the screen. The Timedock looks great and the Pebble looks great on it, so even if the watch doesn’t need a charge this is useful to have to store the Pebble, almost like a mini display unit. Is the Timedock an essential purchase? No, you get a charging cable with the Pebble that does the job. Is the Timedock a small luxury add on for your beloved Pebble? Absolutely!